Overcoming Movement Disorder: Part Boy. Part (Kinesio) Tape. 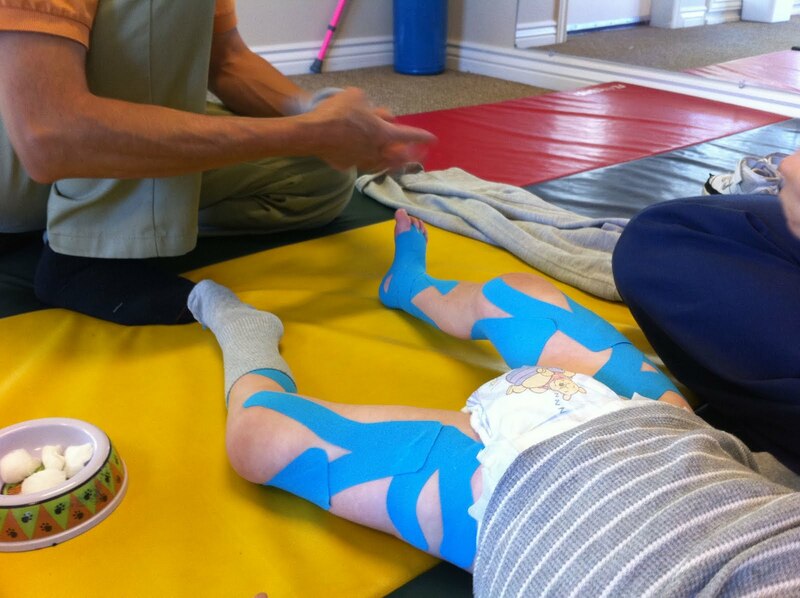 Worth well more than a 1000 words for understanding the concept of kinesiotape. Thanks, Barbara! I think I am most impressed that the tape HAS helped with his drooling! The tape is off to give him a break for the weekend--and so our family portraits are with Bertrand rather than Pink Beard. But, I am actually excited to get the tape back on next week and see if his drooling completely disappears. It's almost gone as is. That alone is worth the price of this intensive therapy. 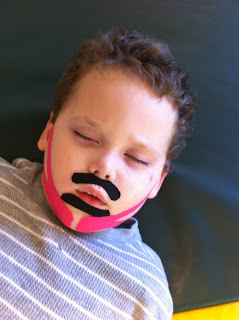 I've asked Sergio to look into using the kinesiotape to encourage his eyes to close completely during sleep. We'll see. I am a speech therapist and I work a lot with children with feeding disorders, movement disorders, etc. Would you be willing to share with me the therapist's information so that I can get details on oral motor kineseotaping? Please let me know! Thanks! LM - The therapist who did the oral motor tape, is Sergio Orozco at the Now I Can Foundation. A week of the taping stopped the drooling for about 2 months, but eventually the drooling restarted. We're re-taping him this week in hopes of achieving another drool-free stretch. Thank you very much for that info!! I will be contacting him soon! This is an under-used technique. 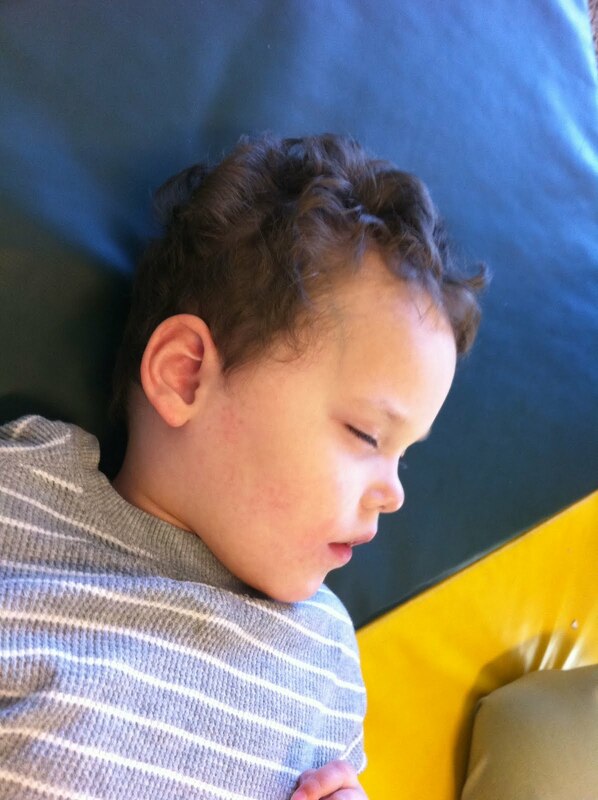 I had a preschool student with asymmetrical facial and lip movement due to a syndrome. I used corrective taping for rounding on the one side, she cleared bolus, she started babbling more and we really think it helped with the asymmetry. I regret not taking pics. She kept the tape on for the 30-40min daily. 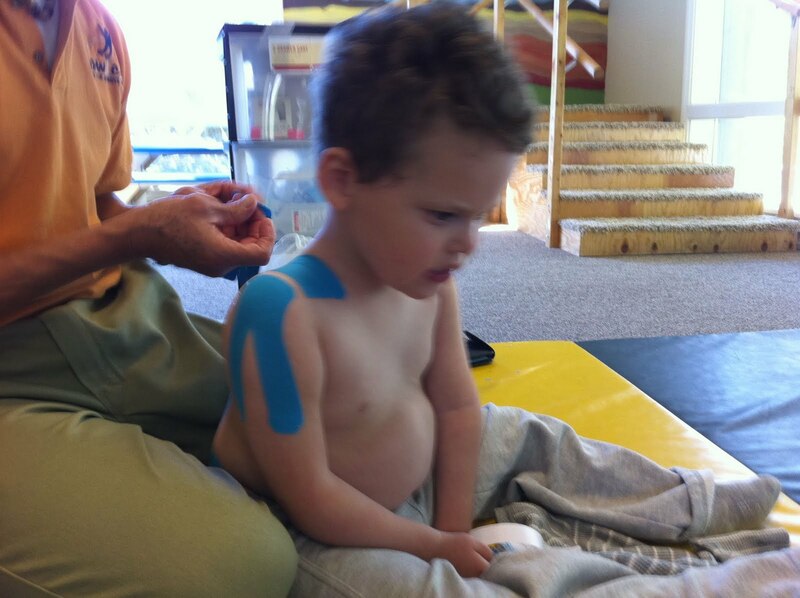 Another child allowed the obicularis oris tape and left it on. Not every child will leave it on especially if they are aware. The OT/PT all took the training and showed me the 2 tapings in the manual, but they taught me the theory behind corrective vs.facilitation vs. relaxing tape. With the aid of anatomy and physiology, I had success. Plus I have had major success using it personally on my running injuries. Go for it. I am actually writing a social story for it for the OT/PT dept to help kids learn to how it works. Thanks, Kathryn. We use the tape every few months whenever Bertrand begins to drool again. A few days of the tape and his muscle memory kicks back in. We agree that it is underutilized by most OTs/PTs. It works great for us! Does anyone know of the next training course for SLT's in the UK?